we offer a wide range of standard height bedroom units in various widths. As standard the units are 760mm high. Custom sizes are available. These bedroom units are available in highline, drawerline or drawer pack units. Bedroom corner units are also available. Single drawer knee hole units allow for dressing table construction. 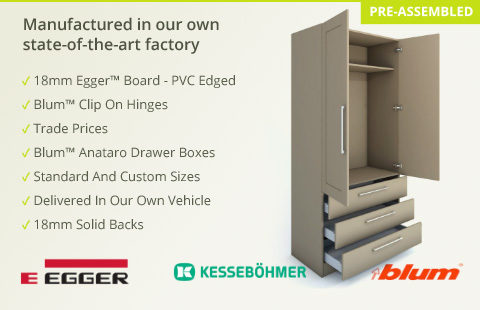 Drawer units are now supplied as Blum soft close Tandembox drawer boxes and runners as standard. Doors and drawer fronts can be purchased from our bedroom doors and drawer fronts section.